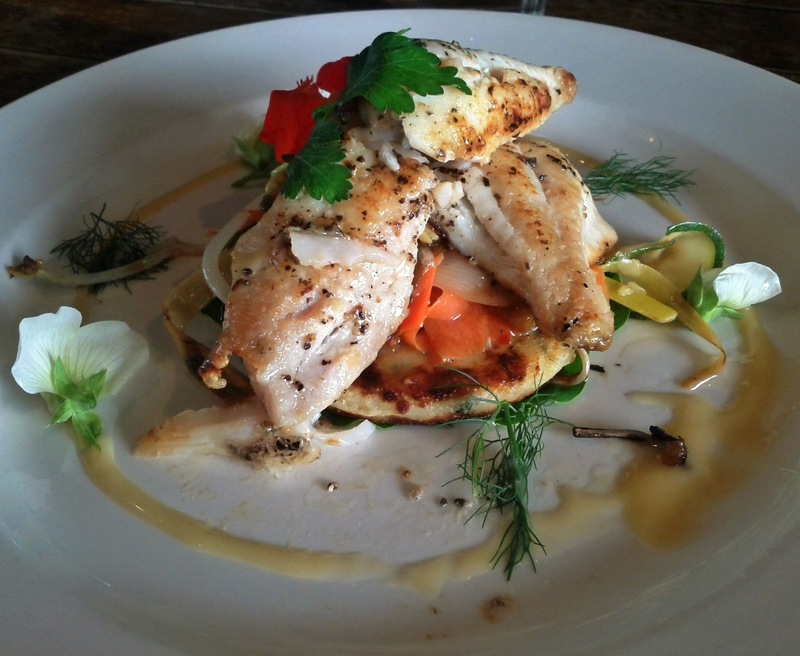 We detoured to Jindivick to check out the Harvest Kitchen after reading about it in the Broadsheet. Initially we drove past as most of the signage outside was for the neighbouring "Jindivick Country Gardener" rare plant nursery, but we located it on the second pass, it's close to the junction of Jacksons track and the Main Jindivick road. The situation is uber scenic, with a kitchen garden between the road and the cafe perched with a stunning outlook across west Gippsland. Inside everything was spik and span. Our table for against the wall two was near the fire, which was nice on a winters day, but one of the seats was set facing the wall, while the other had a glimpse of the panorama, it felt like things could have been arranged better. 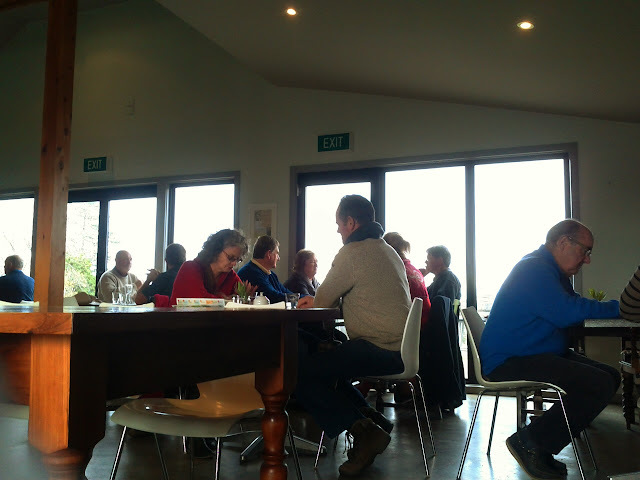 There were plenty of other diners on the Sunday lunchtime when we visited. We'd both hoped for a lightish lunch, maybe a bowl of soup or something similar, the menu though featured either sharing dishes which didn't suit our dietary needs, or more substantial dishes. I settled on the special of bream on semolina gnocchi with veggies, frustratingly when we ordered I was told it was a smaller dish, so thought a little longer and in the end went ahead. It turned out to be between entree and main size, with plenty of attention on appearance, including a few flowers on the plate. The gnocchi turned out be a single disk, rather than the usual pillows, which after the initial surprise wasn't a problem. The veggies were super finely sliced and three pieces of fish were well cooked and complimented by the lemony sauce. The duck and kale with potato gnocchi was also not a large dish, but more substantial. 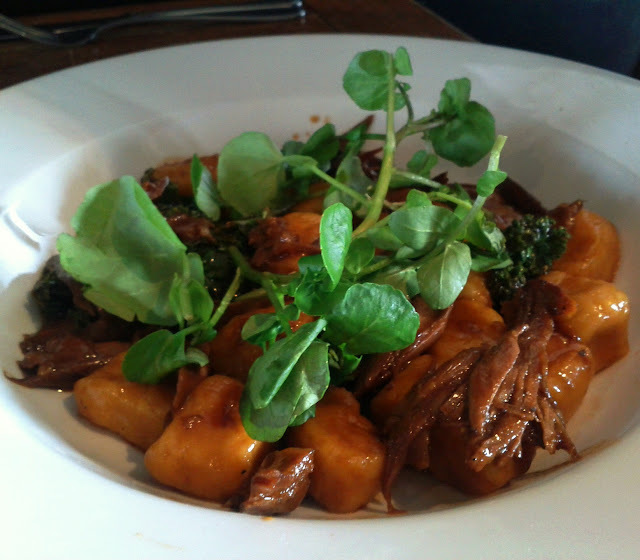 The gnocchi was slightly doughy, but the duck and kale both got good reports. The service was a little slow at times, but it was busy. Perhaps we were expecting something a little more low key, but the food seemed unnecessarily fussy, but that might just be my taste. The bill was just over $50 with a (good) coffee. I doubt we'll go out of way to return.